The Big Spring Homemakers Club met Wednesday, March 28, at the home of Mrs. Joseph Barnes to celebrate their 41st anniversary as an organized club. At the meeting, discussions were held on Clean-Up Month, collecting stamps for a kidney dialysis machine, and Cancer Workers for April were organized. The lesson was on "Short Cut Cookery." Also at the meeting, the club made plans to visit the individual responsible for organizing the Big Spring Club. Mrs. Ruth Fontaine Scott of Hodgenville organized the club in March of 1932. 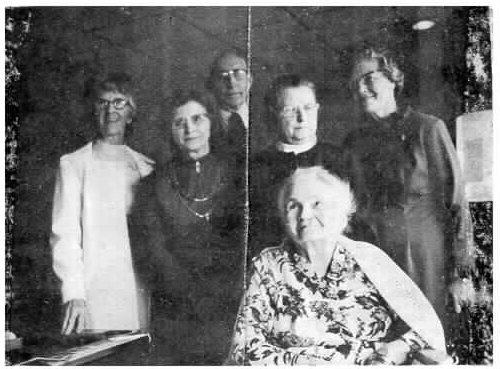 During the time Homemakers Clubs were being first organized, Mrs. Scott was a friend to the clubs present charter members. She was also a very active 4-H leader involved in civic and community work. Mrs. Rickey Stenenson was Hardin County Home Economics Extension Agent at that time. They held the first club meeting in Big Spring School. Charter members of the Big Spring Club visited Mrs. Scott on Sunday, April 1, and presented her with an artificial flower arrangement and a bouquet of fresh flowers. Present for the occasion were Mrs. Scott's son, Jack Scott, president of Citizens Bank of Elizabethtown; her daughter; Ray Hopper, past Meade County extension Agent; charter members, Mrs. Alex Martin, Mrs. Carl Martin, Mrs. Anna Mildred Best and Mrs. Dewey Board; and Mrs. Edward Cochran, club secretary.